The first day of school for many pupils surrounding the Mytholmroyd area was unfortunately not the best start! At around 7am on Wednesday 5th September 2018, a burst water main which happened outside the Dusty Miller pub, which was badly flooded in 2015. A little ironic that flood prevention work has been taking place along the Burnley Road when the burst occurred, again flooding the road. As our own operations team jumped into action we were able to divert the morning school buses for both North Halifax Grammar School M2/M7 service and the Rishworth & Heathfield Schools Route 11 buses to ensure the students arrived to school safe, although a tad late. A temporary bus route for NHGS and Rishworth and Heathfield Schools was implemented along with regular updates on our social media as well as the school’s updating the passengers affected. We are happy to say that after only 50 hours since the burst we have notification that the Burnley Road will re-open at lunchtime today, please see press release below from Yorkshire Water. We’re happy to announce that the road closure on Burnley Road in Mytholmroyd will be lifted from lunchtime today. Thanks to the great efforts of our contractors, Morrison Utility Services, and our colleagues on site, the work has been expediated and completed sooner than we expected. 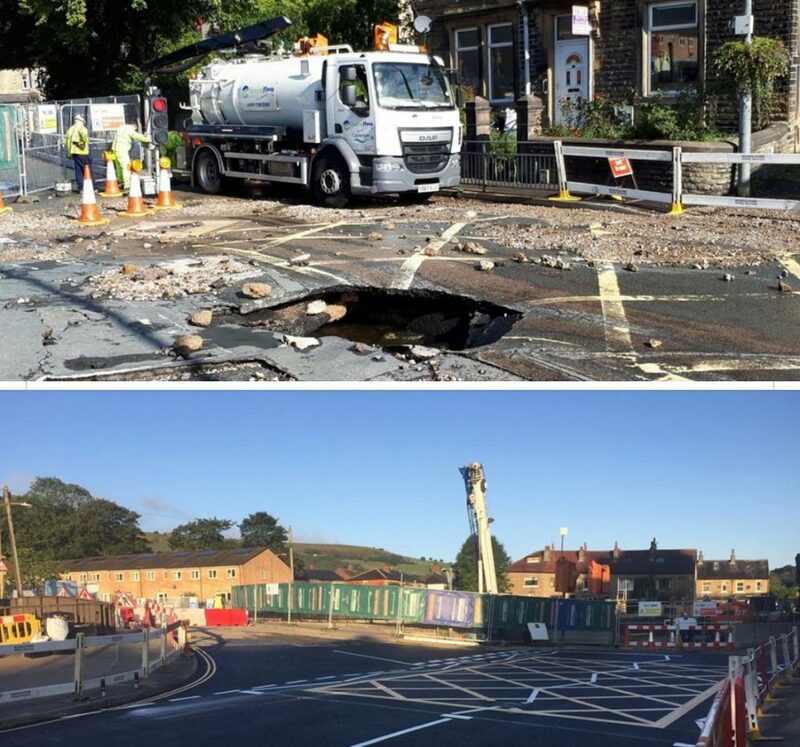 The fresh tarmac is currently drying and once our site manager and Calderdale Council’s highways team are happy that the road is safe and dry, we’ll remove the road closure signs and let the traffic through. We’d like to thank everyone again for bearing with us while we were fixing the damage caused by the burst pipe. The community has rallied around and our colleagues on site would like to thank the local residents and businesses for their support. We’d also like to thank Calderdale Council, West Yorkshire Police, West Yorkshire Fire and Rescue Service and the Environment Agency for their help over the past few days. Thank you to all our staff who implemented and managed the diversions and of course to all our passengers and parents for your patience and understanding.